Thanks to the kind generosity of H.R. Kaufmann, president of Xidy, the original ROM images for Robot Bowl have been made available for free, non-commercial use. Before downloading, you must acknowledge that you understand these images are to be used only for non-commercial purposes. Do this by checking the box below the download button. 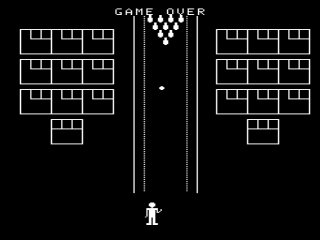 Robot Bowl was a black & white bowling alley game designed and programmed by Edward Valeau and Howell Ivey of Exidy. 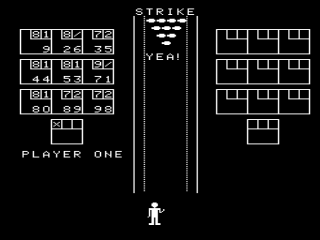 The game featured one or two robot bowlers playing with the standard bowling rules. 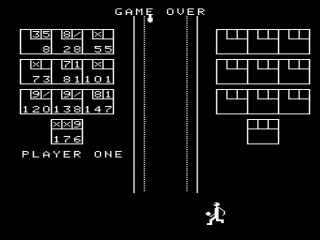 To control the outcome, the game had five buttons: left, right, shoot, hook left, and hook right. "Hooking" the ball was the key to getting a good score, as you could only hook the ball after it had been thrown. This made it easy to pick up a spare, but the game made up for it by making splits very common. 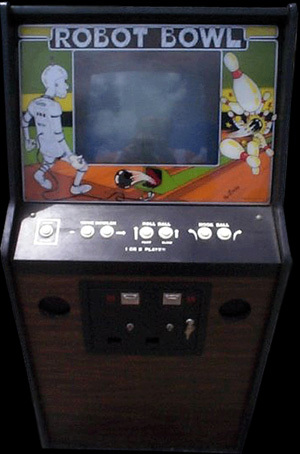 Robot Bowl was available in two different dedicated cabinets, an upright and a cocktail, both of them used the same internal hardware. The Robot Bowl upright was of the common 1970s 'short cabinet' design, as the machine had no marquee and was only as tall as the monitor. Some machines also had a decorative 'ball return' on the front at the very bottom of the cabinet. There is an interesting story behind that. 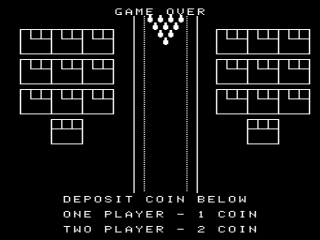 At the time the game was created, Exidy had just purchased Fun Games and had a number of cabinets left over from one of Fun's driving games. They used these cabinets to get Robot Bowl into production quickly. The only problem was that the cabinets had a hole in the front where the gas pedal had been. Michael Cooper-Hart suggested that they silk-screen the words 'Ball Return' over the hole. The Robot Bowl cocktail was a square box with a perfectly round top. 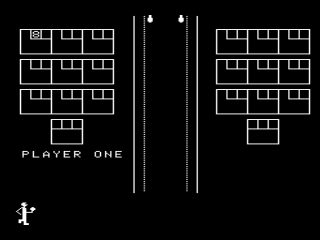 The player controls were on either side of the monitor (and you actually had to look at the game sideways to play). This machine had no decoration of any kind.